Arianism to their converts—especially Bishop Ulfilas, whose work lay among the Germanic tribes who afterward took over the Roman West. Thus the Goths, Vandals, Lombards, and others were, from the Roman Catholic point of view, heretics when they invaded the Roman territories; and the papacy had the greatest difficulty converting them to the orthodox Catholic beliefs. 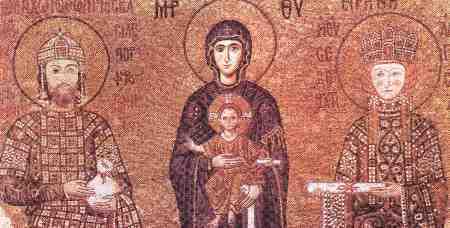 In later centuries the Byzantines continued to preach their own form of Christianity, which was still doubtfully orthodox in the eyes of the pope. 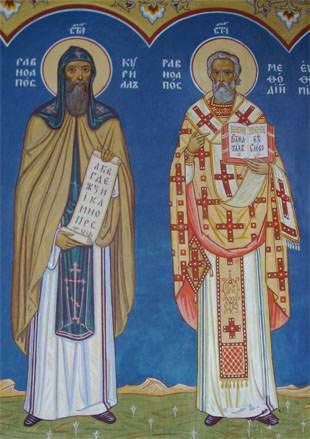 The most important single mission was probably that in the ninth century of Cyril and Methodius, who devised a Slavonic alphabet, making possible the use of a Slavonic liturgy for church services. Though the Slavs as far west as Bohemia and Moravia were converted as a result of their work, the German bishops and the popes who supported them were too powerful to allow this penetration from Constantinople to become permanent. But territories to the east for the most part came within the Byzantine religious, and consequently cultural and political, sphere of influence. Above all, Russia came under Byzantine influence, not only in religion, but in government—a heritage whose consequences are still with us today. The regime of the tsars was closer to that of Constantinople than it was to any Western autocracy. When Constantinople fell to the Turks in 1453 the grand duke of Moscow, soon to proclaim himself Tsar of all the Russias, called his capital the "third Rome" and symbolized the title by marrying the niece of the last emperor of Constantinople. He also proclaimed the patriarch of Moscow as the chief official of the Orthodox Church. Barbarian as Russia still was in essence, in comparison with the regime the tsar claimed to have inherited, the form of Byzantine rule, itself inherited from the later Roman Empire, was retained in Moscow until the Revolution of 1917. Even under Stalin a family likeness to Byzantine absolutism could still be discerned, in spite of the Marxian intellectual framework which had become the official philosophy and justification for his state. During the years following the death of Charlemagne, the Byzantine Empire was little connected with the West, except for Venice and the northeastern Italian territories which were retained by Constantinople from the old exarchate of Ravenna, and southern Italy, which was effectively subjected to Byzantine rule once again by Basil I (876-886). Basil, however, was unable to dislodge the Muslims from Sicily, and they fully subjugated it after his death. During his reign the empire began a period of orderly government and firm rule under the so-called Macedonian dynasty, which occupied the Byzantine throne for more than 150 years, with the succession rarely disputed. The Muslim menace had now receded, and the Asiatic provinces of the empire were kept securely under Byzantine control. Most of the difficulties experienced by the empire were from the continued invasions of Slavs and Bulgars into its European hinterland, especially the Balkan Peninsula, which the emperors had much difficulty in holding. Already in the eighth century the Bulgars had entered the Balkans, and the Byzantines had conducted several campaigns against them. In 865 the Bulgarian khan, who now called himself a tsar, allowed himself and his people to be converted to Christianity. But he had many difficulties with the patriarch of Constantinople, and for a long time he hesitated between Rome and Constantinople, fearing that religious union with the latter would lead to political subservience. However, when the people insisted upon adopting a Slavonic liturgy, contrary to Roman practices, and when Rome did not fall in with his views on other matters, he turned to the Eastern rite. His son Symeon found coexistence with Constantinople difficult and spent most of his reign fighting against the Byzantines—making, indeed, a serious attempt to win the throne of Constantinople for himself. At one time he even called himself emperor of the Romans, a title which the pope recognized and the emperor in Constantinople was powerless to prevent. After a brief interval, during which the Russians, led by Sviatoslav, attacked Bulgaria and were driven off by the Byzantines, who took the opportunity to destroy the Bulgarian kingdom also, another son, named Samuel, restored the kingdom and established his own patriarchate independent of Constantinople. He extended his empire so that it was hardly smaller than what remained to Constantinople. But the Byzantine emperor, Basil II, an energetic and resolute soldier, accepted the challenge. In a long and terrible war—Basil assumed afterward the title of Bulgaroktonos, "the Bulgar-killer"-—he destroyed the Bulgarian empire and annexed the territory in 1018. During the war the Russian prince, Vladimir, accepted Christianity for himself and his people, and thus began the close connection between Russia and Constantinople, a connection whose effects are still with us today. Following the annexation, Bulgaria was entirely incorporated into the Byzantine Empire and lost its identity until the end of the twelfth century, when the decay of the empire under the blows of Seljuk Turks gave the Bulgarians another chance to build an independent state. This state in due course fell to the Ottoman Turks. In the early eleventh century the Macedonian dynasty fell into the hands of a number of empresses whose husbands ruled through them. The century was one of general decline, with the empire having first to be defended against the Normans from the West and then against the expanding Seljuk Turks, who inflicted a severe defeat on the Byzantines at the Battle of Manzikert in 1071. In 1081 Alexius Comnenus became emperor, founding a dynasty which endured until the Latin conquest of Constantinople in 1204. Alexius was compelled to call in the Crusaders from the West to help him against the Turks, beginning an era of increasing influence of the West in Byzantine affairs.